How does GetResponse empower ecommerce businesses? With a full suite of optimized ecommerce tools, you can turn shop visitors into raving fans and start selling more. Build a profitable email marketing list and cultivate a loyal customer base. Email and online marketing are the perfect tools for maximizing customer lifetime value (CLV). You can open up a world of opportunities for upselling, cross-selling, niche selling, add-on sales, and repeat sales. Turn casual website visitors into raving fans. 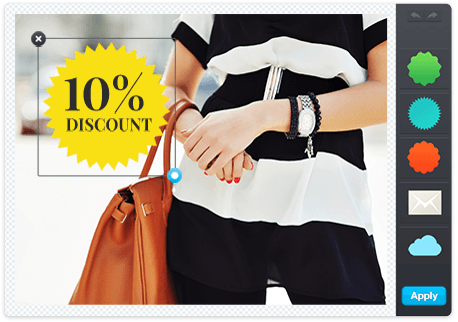 Prepare a package of discounts and seasonal offers that the buyers can’t get in stores. Create spectacular landing pages with product descriptions and vibrant customer stories. Send automatic updates about new arrivals and alerts when the product is out of stock. Use signup forms to invite your store visitors to subscribe to seasonal promotions, industry events, and webinars. Show your loyal customers some love. Keep in touch with your customers and entice them back. 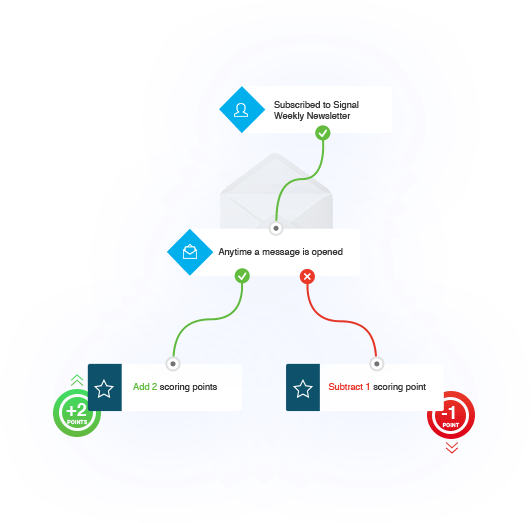 Use intuitive automation workflows to build loyalty programs, retention strategies and refer-a-friend policies to win your customers’ hearts and minds. Recommend products to customers automatically based on what’s selling best in your store. Add scoring points for every interaction and reward the most loyal customers with exclusive discounts. Segment customers based on their ecommerce data and send targeted offers that complement their stage of the customer journey. Publish your landing page and offers on Facebook and watch how the number of fans grows. Create online surveys to solicit feedback about your customer support team, delivery services, or the quality of your products. Integrate with popular ecommerce platforms. Does your ecommerce store operate on Magento, WooCommerce, or Prestashop? Or perhaps it was developed in-house? No problem. 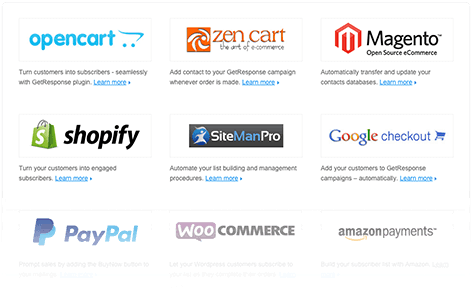 Choose from GetResponse ecommerce integrations for popular commercial applications. Automatically win-back cart abandoners with targeted, timely reminders. Visit our Developer Zone free of charge and use all of the API resources your programmers need. Consolidate contacts from spreadsheets, CRM, and social media and manage it all from one platform. Send your customers only highly relevant offers, tailored to their needs. Segment your audience according to age, location or gender and prepare highly personalized offers they can’t resist. Create unique welcome cycles triggered automatically after a new subscriber signs up. Send automatic transactional emails and notifications when orders are ready to be dispatched. Offer a special selection of products of interest to your customers, based on their most recent activities. 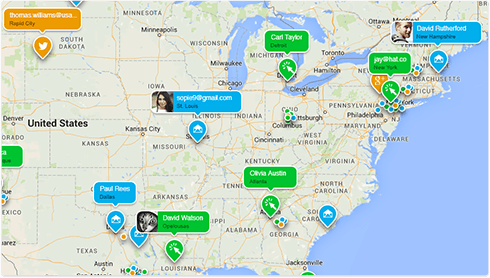 Assign tags based on brand, price, or color preferences of your customers. Tell your ecommerce story with a beautiful design and rich content. 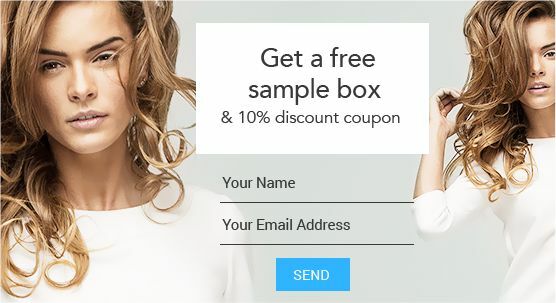 Choose from a variety of email templates created for different industries and quickly customize the design to match your business. Upgrade your image with online communications designed with drag-and-drop ease. Present your products with beautiful images and tutorial videos. Connect your audience with the experts with just one click. Introduce your staff through email and keep the relationship strong through webinars turn a great first impression into long-lasting relationships with your clients. Give access to your customer support agents to inform them about important purchases, delivery updates, and website changes. Contact your shoppers in different languages and control email delivery by time zone. 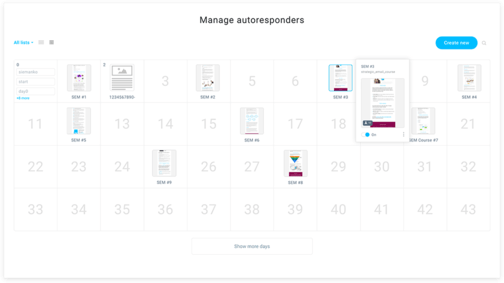 Let your customers decide how often they would like to be contacted and send them messages only at specified time frames. Keep up with the mobile generation. Become user-friendly for mobile shoppers, the fastest-growing market segment on the planet. 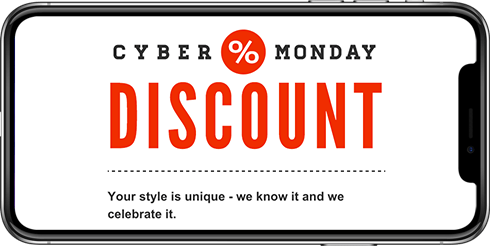 Create email and landing page designs that automatically adjust to fit the screens of smartphones and tablets. Grab those red-hot prospects when they’re most likely to try and buy. Use GetResponse mobile apps for iOS, Android and Kindle on any device. 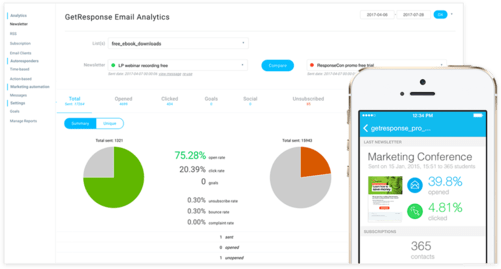 Approve and send promo emails while you’re on the go. Measure results to maximize sales. Are your fingers on the pulse of your ecommerce business? Use A/B testing to identify designs your customers love to open, click, and buy from. Preview at-a-glance charts showing opens, clicks, and conversions and get detailed reports emailed to you automatically. Find out which ecommerce prices and CTAs generate the highest conversion. Your ecommerce customers will love the incredible campaigns you create using GetResponse. Find out how GetResponse can drive sales in your online store.